Instead of eating lunch, I ducked out between cloudbursts to continue my investigation of the creek trail. Thank you, new muck boots, for keeping my feet warm and dry, even if you don’t really fit and my socks immediately scrunch down into my arches. You still allowed me to splash impulsively through muddy puddles towards the trail less traveled, which led me to an unexpected reward: pure white, inch-long, perfectly clean tufts of fur resting airily on the tips of wet grasses above the mucky ground. Today I had no carrying bag. I wrapped my treasure in a package of big, flat leaves and tied it shut with long grass stems. I am still trying to figure out how this furry miracle came to be. I walked today to study colors and patterns, not expecting to gather anything along the way. 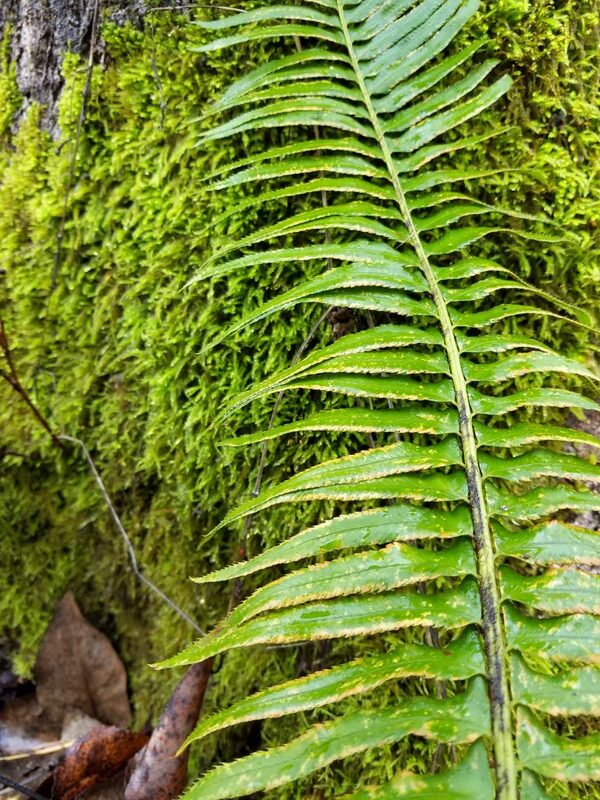 Bright green ferns and moss are thriving in the cold. Most of the grass is still green, or a brilliant yellow on its way to brown. 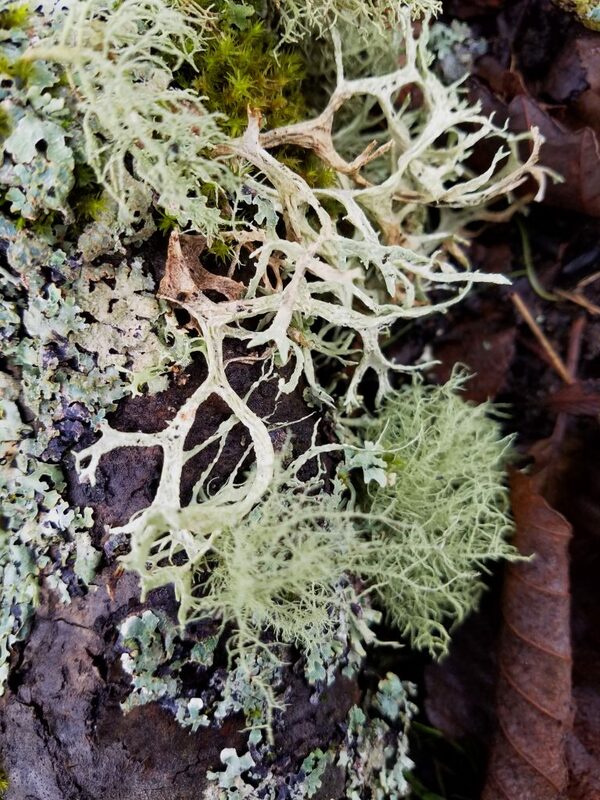 Groves of bare tree branches are an unexpected deep red, or covered with mint green lichen. 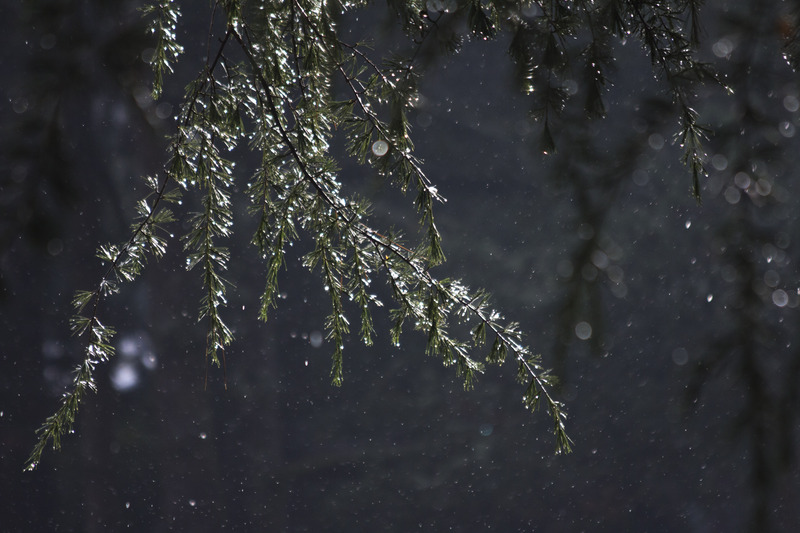 This afternoon, half an hour of sunshine broke through 24 hours of rain. Water droplets hanging off the tips of every pine needle caught the light and sparkled like fire. I noticed the incredible height of the trees around me for the first time. (This is not a flowery hippie thing, they are really, really tall and I don’t understand how I missed it before.) I am glad to be here to see these things. In the studio, work is beginning to come together. I appreciate the days I have here to work on a project that I would only allow hours at home. I have time to rethink, experiment, study, build on ideas, leave pieces to rest, create layers and let meaning evolve organically over time. I have time to not produce. The white fur worked beautifully in a new painting, one of the rare few that just flowed from start to finish. 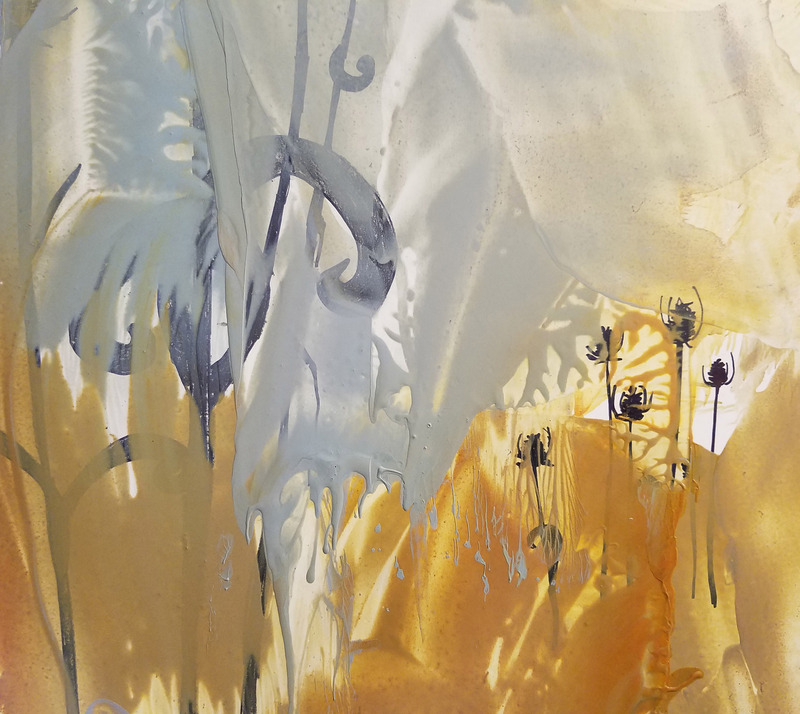 Encaustic is a fast medium. I have 17 boards covered with wax, and that’s working slow. White Fur is finished, one of only two that I completed in a single session. The other four finished pieces took two days. Eleven boards remain in a state of possibility and potential. 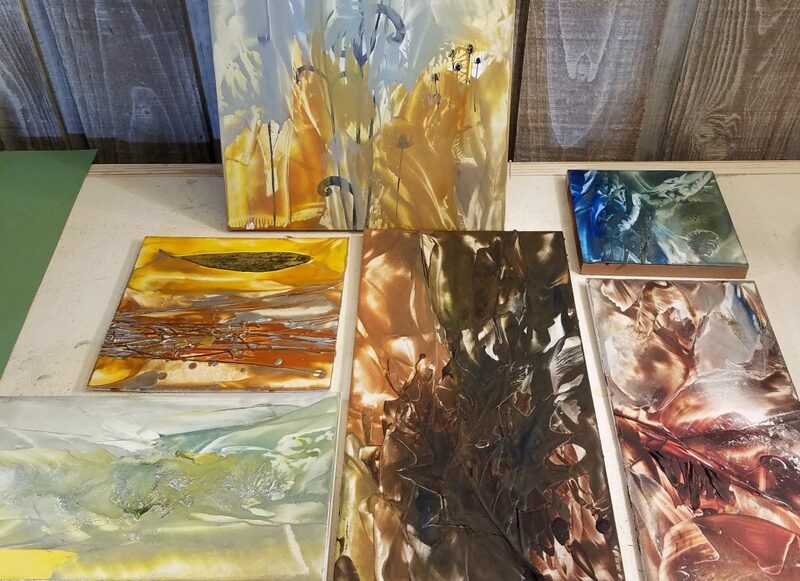 Encaustic is a lovely, forgiving medium that remelts into wonderful new patterns and colors every time it’s touched by the iron. My role is mostly to decide when to stop. Two of today’s new paintings. 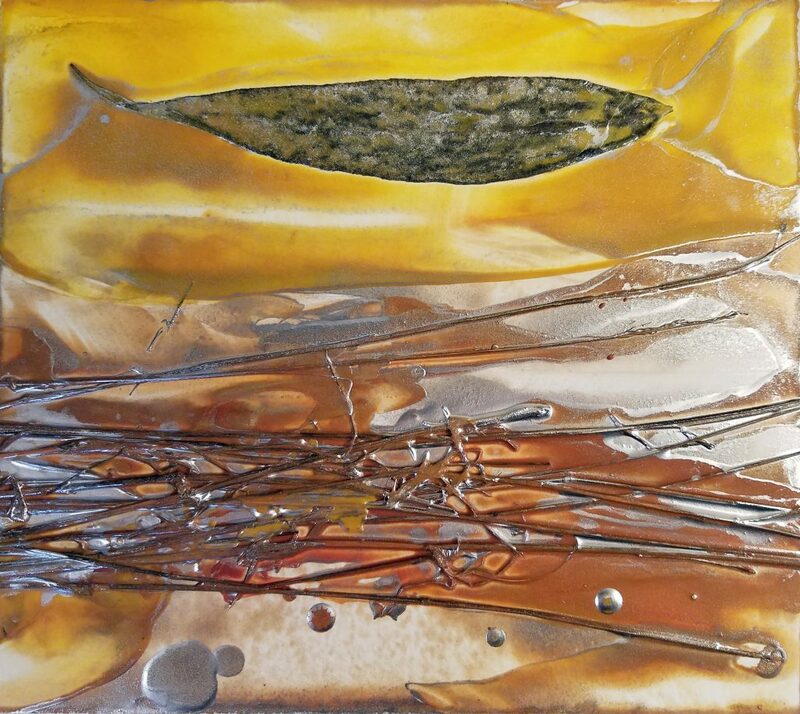 Left: Salmon Creek I, encaustic wax and found objects on board, 7″ x 8″. ©2016. Right: Experimenting with ink and pencil under encaustic.